An in-depth survey reveals that regional chains outpace the national behemoths when it comes to overall satisfaction. According to restaurantnews.com, a 2016 survey about Quick Service Restaurants (QRS) reveals some surprising results about American’s allegiances to fast-food franchises—especially in regards to powerhouses like Chipotle and Papa John’s. Conducted by Market Force Information, which polled more than 10,000 participants representing a “cross-section of the four U.S. census regions,” the study is organized into four key categories: pizza, Mexican, sandwich, and chicken chains. 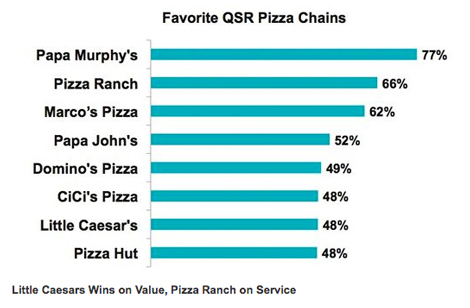 While places like Papa John’s and Chipotle regularly dominate headlines and have clearly cemented cult followings, they did not earn the top slot for their respective categories, which were sorted based on customer feedback on several key indicators of satisfaction: quality food, healthy food (LOL), fast service, friendly service, value, atmosphere, and cleanliness. In fact, Papa John’s didn’t even place in the top three for favorite pizza chain. It was eclipsed by another Papa—Murphy’s—which earned 77% of the vote and won for best quality (and healthiest) pizza by a large margin. 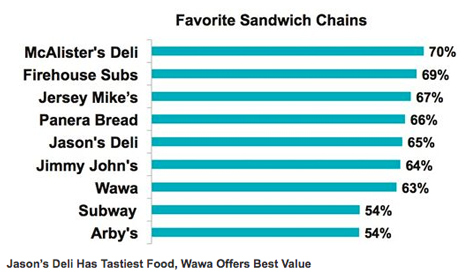 Interestingly, some chains performed well in certain categories but did not rank well overall. Little Caesars won for value, for example, and Chipotle is known for food quality (maybe the study was completed before the E. coli outbreak?) 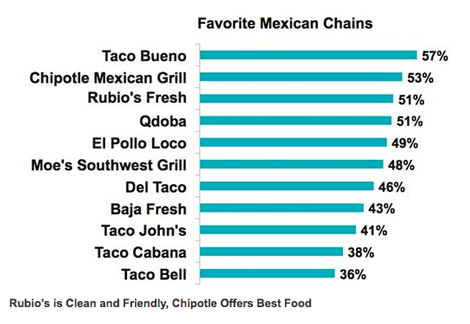 but got edged out in the Mexican category by Taco Bueno, a regional Texas chain. 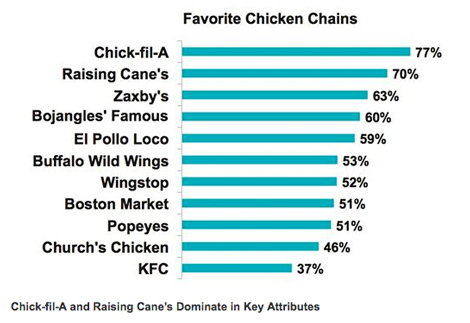 When it comes to chicken, Chick-fil-A and Raising Cane’s dominate across the board—sorry, Bojangles’.